We’ve read Quick As a Cricket a few times through now, and the kids enjoyed using this flannel board set I downloaded from http://www.kizclub.com/stories1.htm. This link will actually take you to a page of many different free printable graphics for classic children’s picture books. Pretty awesome. The only disappointment is that there are no pinnable images, so I can’t pin this resource to any of my boards. You can get these sets in black and white or for in color – all free. Pretty awesome. I made this flannel board way back when. It’s just a heavy-duty poster/presentation board with felt glued on to it. I should actually call it a felt board – velcro doesn’t stick to flannel. I printed out the graphics, laminated and cut them, and stuck some Velcro hook circles on the back of each animal. 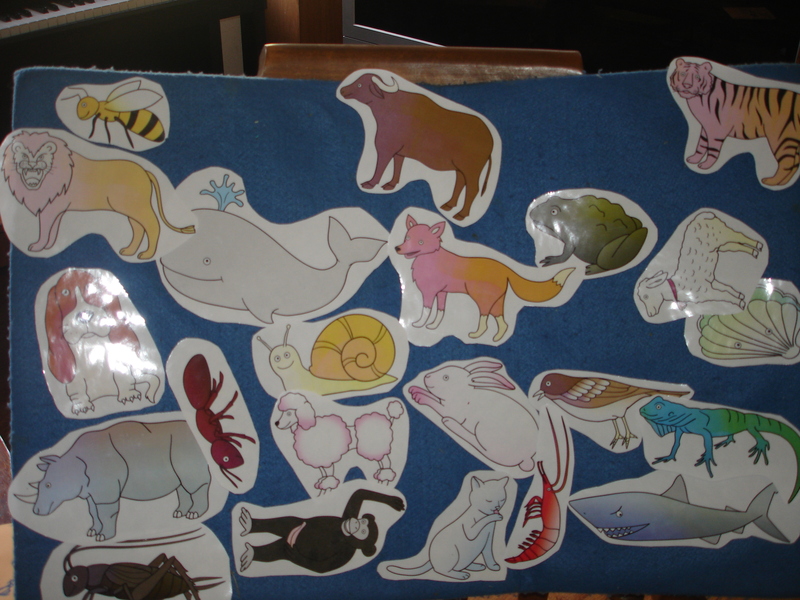 I laid out all the animals on the floor and read the book, giving the children turns to find the animal that we read about on each page and stick it to the board. They LOVED it! I was really impressed with the quality of graphics on the site – very cute, very well done. Any other resources out there for Quick as a Cricket? (Get my free printable sequencing cards for Quick as a Cricket here: https://wordsofhisheart.wordpress.com/2013/03/25/quick-as-a-cricket-free-printable-sequencing-cards/. 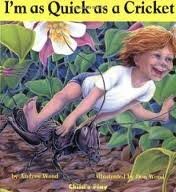 Quick as a Cricket is another beloved children’s book brought to you by the dynamic author/illustrator team of Audrey and Don Wood of The Napping House fame. Each fanciful illustration is accompanied by a line of text underneath it with the same beginning phrase with only the adjective and noun changing, i.e., “I’m as hot as a fox” on one page and “I’m as weak as a kitten” on the next. I originally chose this book for when our Letter of the Week was Q, but there are so many language elements to practice in this book, I had to expand my agenda a bit! You’ll find opportunities for your little one like identifying nouns and adjectives, emotions (sad, happy, mean, nice), animal vocabulary, sequencing, opposites, counting, and I’m sure I’ve missed an element or two. It’s also a great early reader for kids because the majority of each sentence is the same. Our first attempt at a Build-As-You-Go Story Board was a roaring success. Make sure to click the link for a full set of directions. We chose to document our zoo trip this way, so the first thing I did was I used Pictoselector to create a A Trip to the Zoo 9-page mini book. 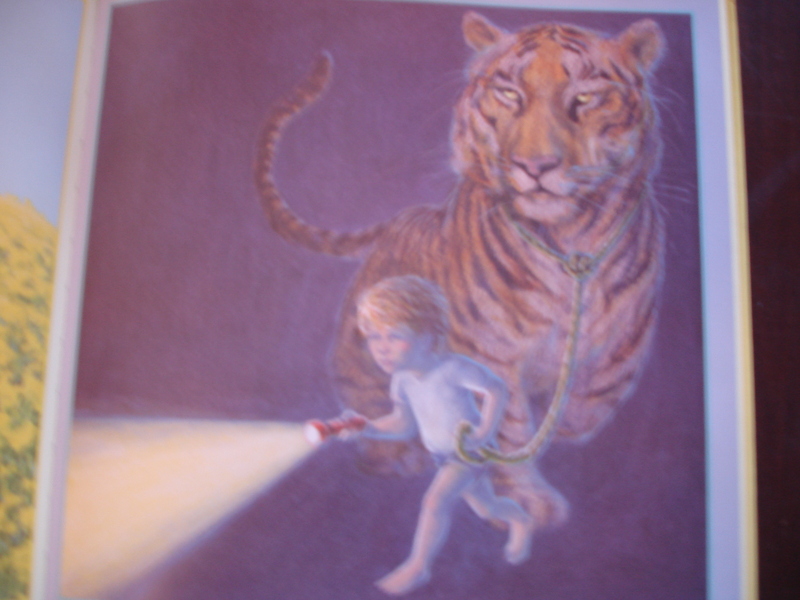 Next I gathered a blank PEC board and the Zoo Animal PECs that correspond with the pages of the book, the zoo, peacock, monkey, tiger, snake, and turtle. I laid out the PECs in front of Noah where he could pick and choose as we progressed through the book. I mixed up the order and wasn’t sure if that would make it too difficult for him, but he breezed through it like a pro. Bella was begging to do this when Noah was done, so I let her have a turn too. When she got to the end, she was able to tell the story right back to me using the PECs. It was definitely a classical homeschooling moment – narration at the age of 3. Gotta love it!